Acclaimed Spanish artist Giner Bueno, born 1935 in Godella (a town along the Valencian coast) defines himself as a painter of vitality. 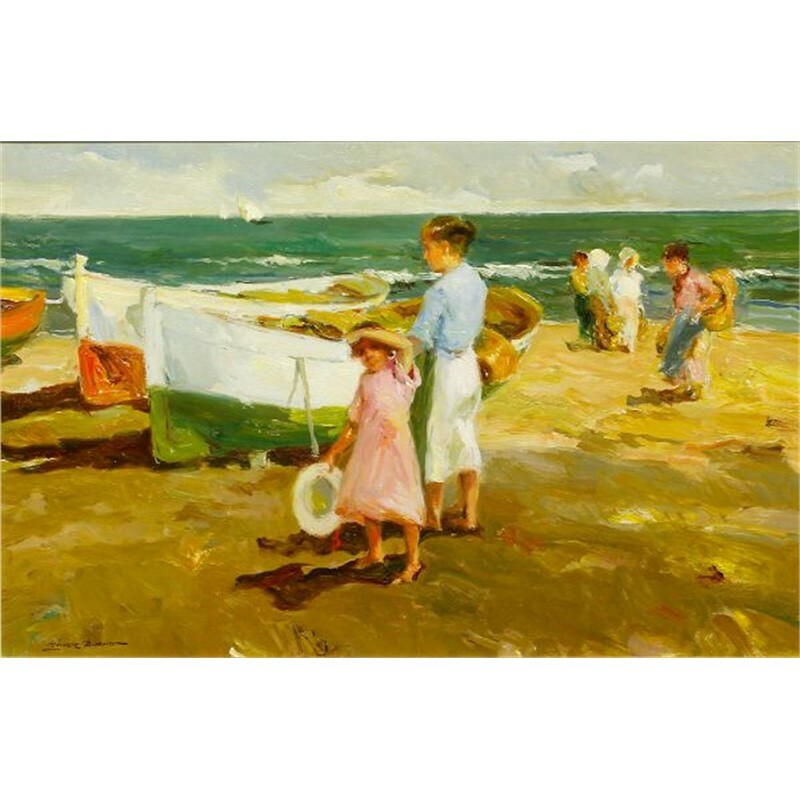 Bueno received his passion for painting from his father, Luis Giner Vallas, who was a distinguished landscape painter backed by prestigious awards and exhibitions in important art galleries. 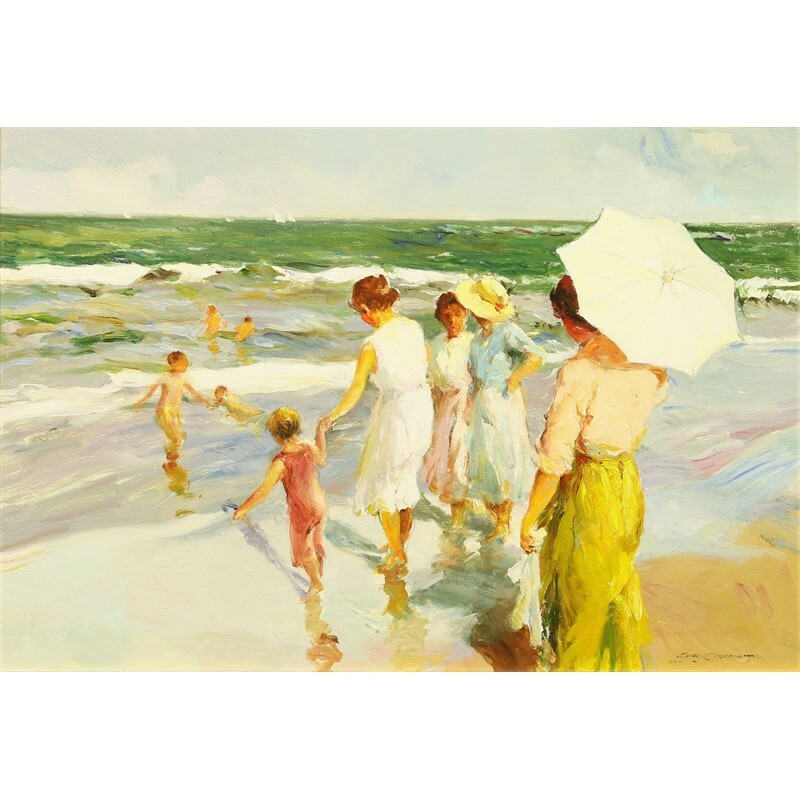 At the age of twelve, Giner was given watercolors and oil paints so that he could join his father and his friends while they painted. “It never occurred to me to spend my time doing other activities which could take my attention away from painting,” says Bueno. 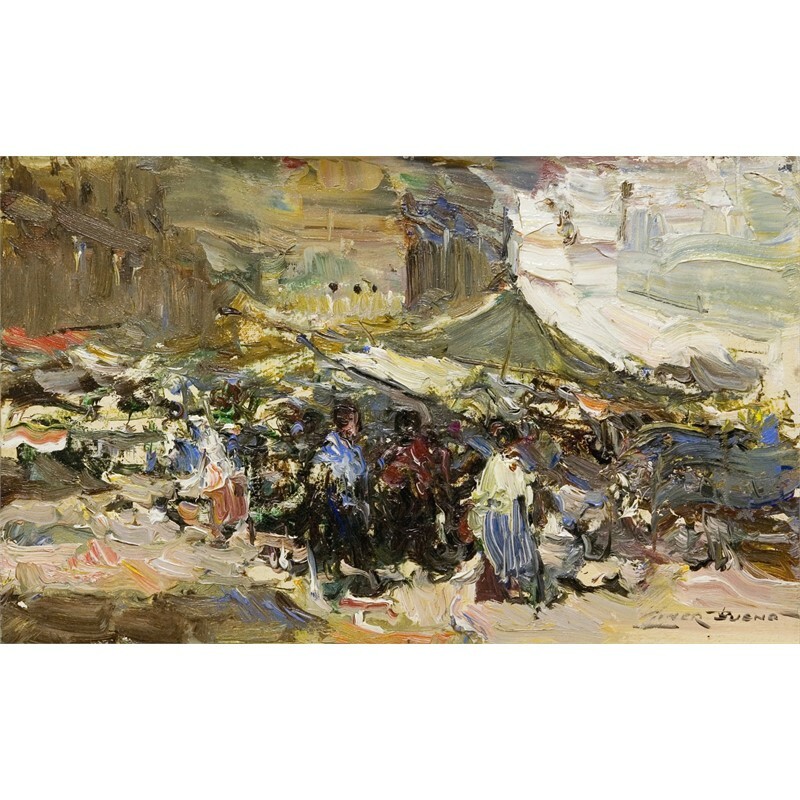 During his earlier years, Bueno exhibited his work in leading Spanish painting contests and received numerous awards including first prize from the Moncada (Valencia) Biannual Painting Contest in 1956 and the Seville Real Maestranza de Caballeria award in 1968. 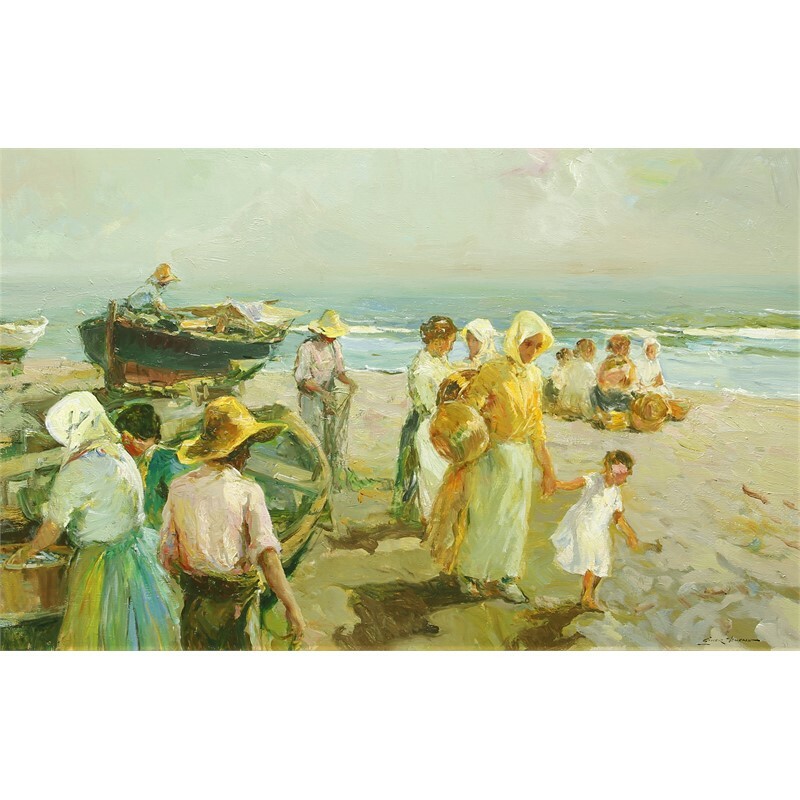 Viewers of Bueno’s canvases are presented with a wonderfully unique look at Spanish coastal life. His plein-air paintings reflect a vast variety of subjects. He renders images of everyday working class fishermen, peaceful seascapes, and women wearing traditional dresses keeping a watchful eye on the children at the beach or at market. 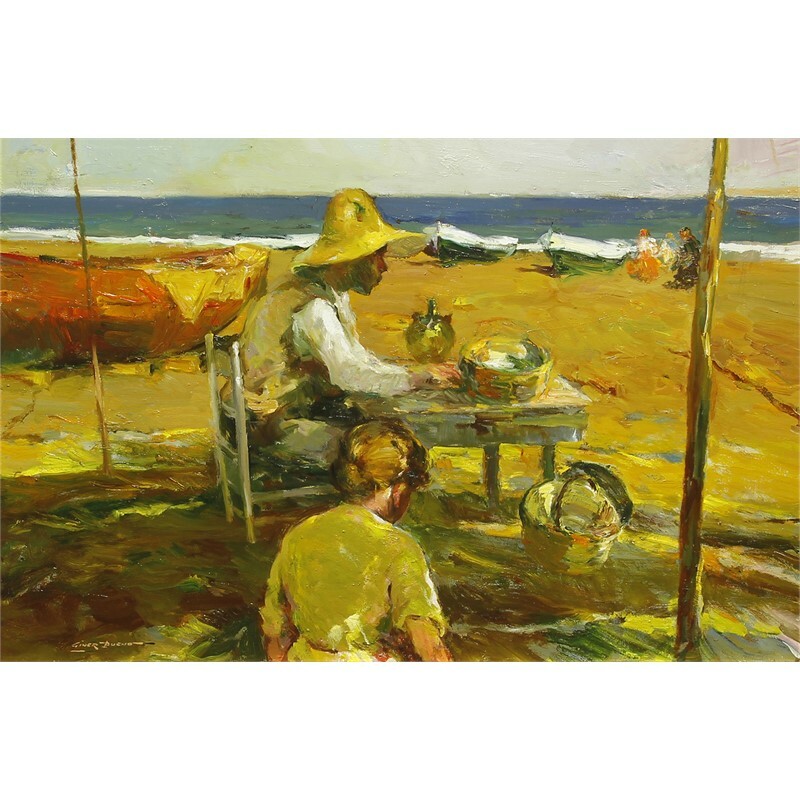 The phenomenal way Giner Bueno depicts the simplistic Mediterranean life truly has earned him the right to be called one of Spain’s most distinguished masters of impressionism. He has participated in over 50 shows throughout Europe and regularly exhibits at the Sala Llorens in Barcelona and the Sala Ingres in Madrid and his paintings have been featured in Spanish galleries in Valencia, Castellón, Vitoria, Gijon and Gerón. Today, his work is featured in leading galleries in the United States thus giving him international recognition. Giner Bueno is a member of the Spanish Association of Painters and Sculptors of Madrid and the Valencia Fine Art Circle. 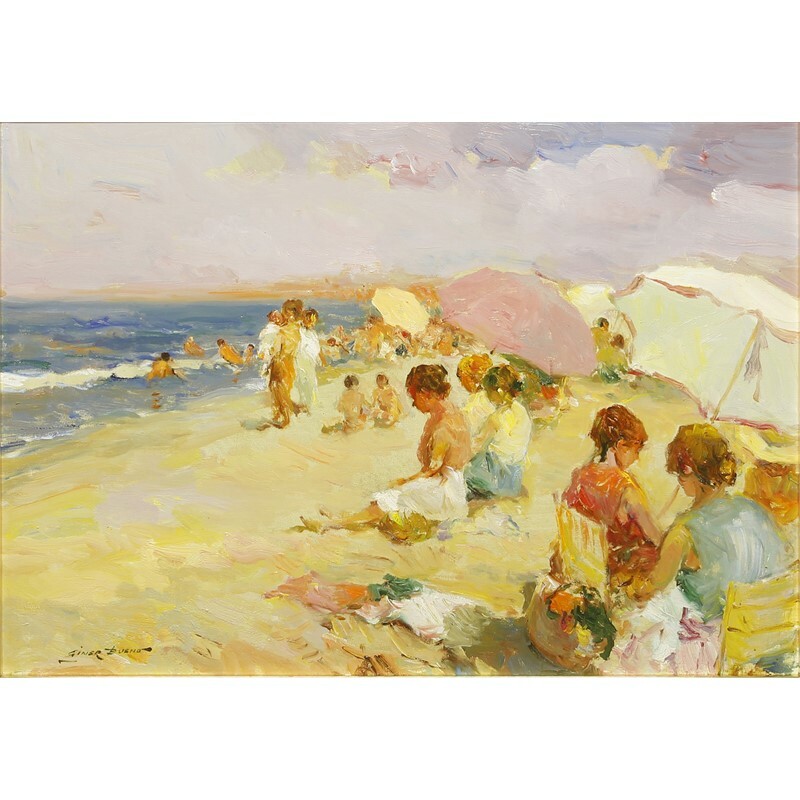 His work also is represented in the Municipal Archive Museum of Valencia, the Real Maestranza of Seville, and in the Florida Museum of Hispanic and Latin American Art. Acclaimed Spanish artist Giner Bueno, born 1935 in Godella (a town along the Valencian coast) defines himself as a painter of vitality. 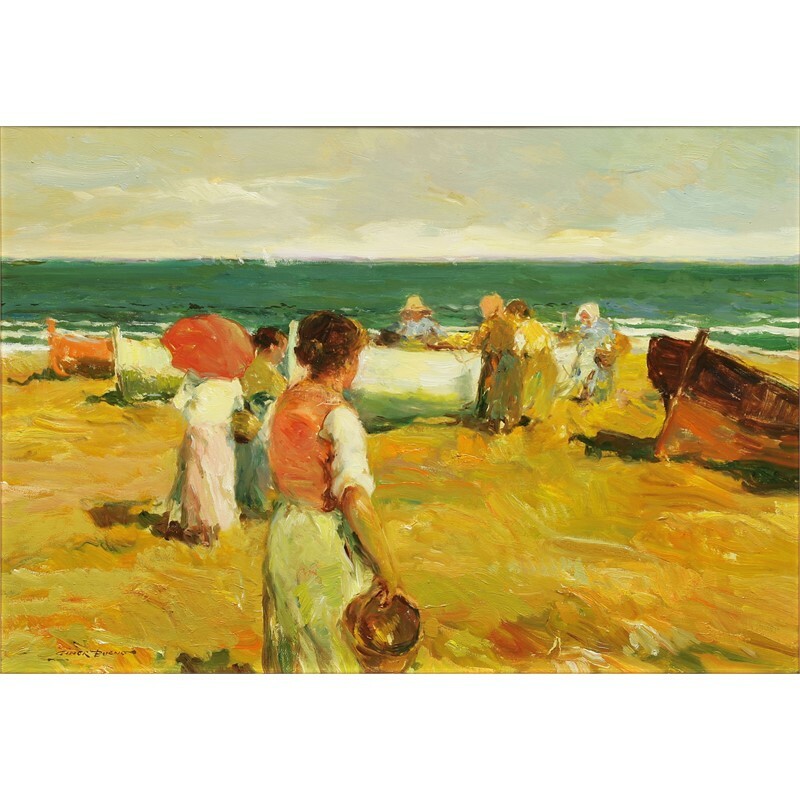 Bueno received his passion for painting from his father, Luis Giner Vallas, who was a distinguished landscape painter backed by prestigious awards and exhibitions in important art galleries. At the age of twelve, Giner was given watercolors and oil paints so that he could join his father and his friends while they painted. “It never occurred to me to spend my time doing other activities which could take my attention away from painting,” says Bueno. Giner Bueno became an exceptional impressionist himself. His talent matured as a student at the Valencia Arts and Crafts school, and he later moved to Paris to further his training through an Education and Leisure grant. 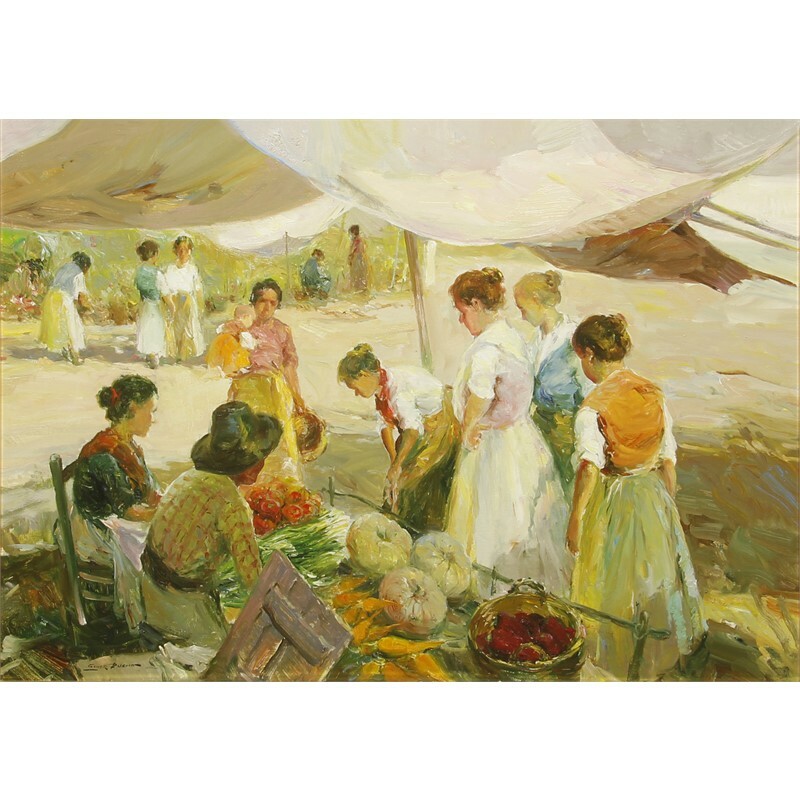 Even with his years of educational training, Bueno still says, “The school where I really learned was my home, so many of my years of training – a considerable number of them – were spent painting and even more importantly, watching someone paint.” During his earlier years, Bueno exhibited his work in leading Spanish painting contests and received numerous awards including first prize from the Moncada (Valencia) Biannual Painting Contest in 1956 and the Seville Real Maestranza de Caballeria award in 1968. Today, all of Giner Bueno’s influences can be seen from his Godella studio, which is situated above his house overlooking a garden. He notes, “It is difficult for a Valencian painter to escape the luminosity of our land, to escape its color and its contrasts. I am captive of all that and in my paintings I try to reflect, within the Impressionistic school, the joy of our beaches, of our festivals and of the life of the villages in the interior of our arid and rugged Valencia.” Bueno reflects the daily diversity of beauty in his countryside’s natural light and color through sweeping brushstrokes of pinks, purples and blues: “My brushstroke is vibrant, nervous, temperamental, always impregnated with the Valencian school that defines the authentic and true masters such as Sorolla, Pinazo or Navarro, for example.” Viewers of Bueno’s canvases are presented with a wonderfully unique look at Spanish coastal life. His plein-air paintings reflect a vast variety of subjects. 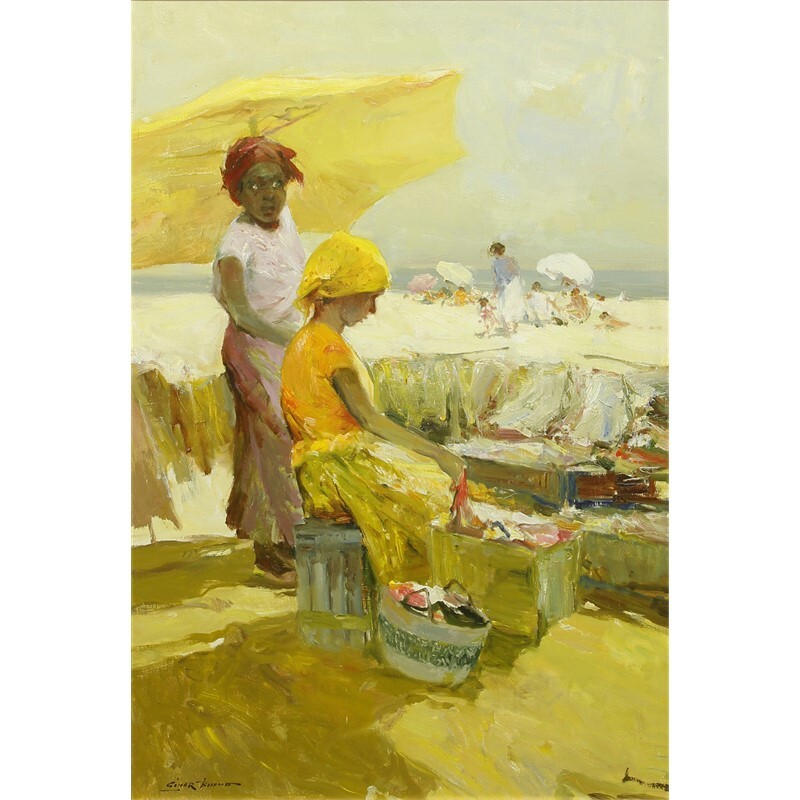 He renders images of everyday working class fishermen, peaceful seascapes, and women wearing traditional dresses keeping a watchful eye on the children at the beach or at market. Chief-Editor and art critic of El Periodico de Catalunya newspaper in Spain, Josep Cadena notes, “The paintings of Giner Bueno allow us to identify with that which is undying in the human personality, with that which, being so intimate, we frequently do not dare draw attention to, and with that which in his paintings we reclaim with obvious pleasure.” The phenomenal way Giner Bueno depicts the simplistic Mediterranean life truly has earned him the right to be called one of Spain’s most distinguished masters of impressionism. He has participated in over 50 shows throughout Europe and regularly exhibits at the Sala Llorens in Barcelona and the Sala Ingres in Madrid and his paintings have been featured in Spanish galleries in Valencia, Castellón, Vitoria, Gijon and Gerón. Today, his work is featured in leading galleries in the United States thus giving him international recognition. Giner Bueno is a member of the Spanish Association of Painters and Sculptors of Madrid and the Valencia Fine Art Circle. 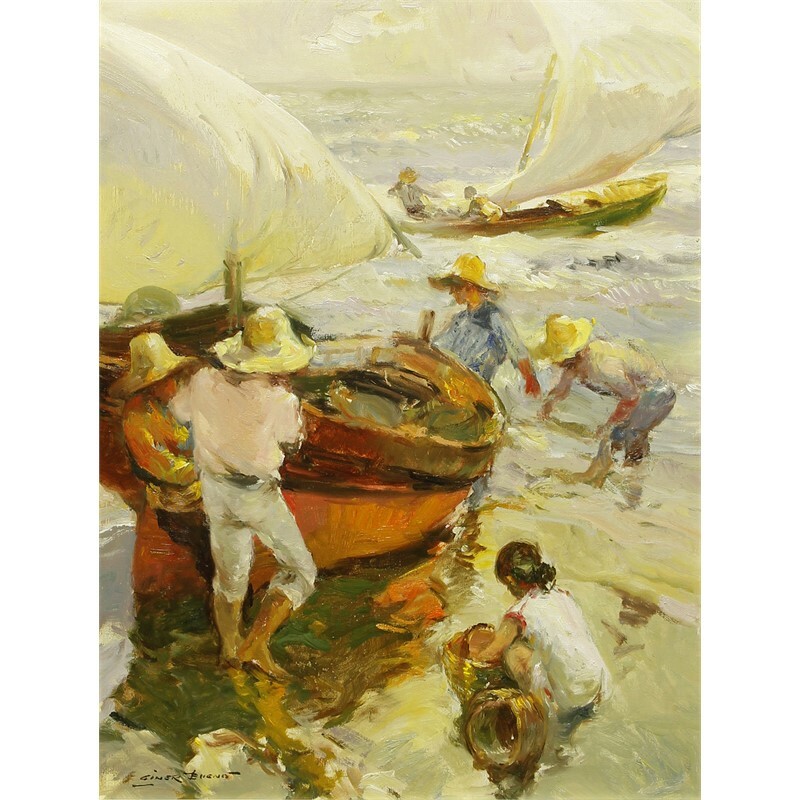 His work also is represented in the Municipal Archive Museum of Valencia, the Real Maestranza of Seville, and in the Florida Museum of Hispanic and Latin American Art.